White City is a new art work by Anna Barham created for White City Underground station as part of Art on the Underground’s Central line series. The work is in two parts: a series of posters at the station and a series of directly related video works to be viewed online. Visitors to the station will see the posters in its passageways. Many feature seemingly identical pixelated squares. These increasingly commonplace symbols are Quick Response, or QR, codes, a type of barcode or graphic data storage device. They carry information that can be accessed with appropriate reader software and a smartphone. Hard Metal Body is a new art work by Alice Channer created for Notting Hill Gate Underground station as part of Art on the Underground’s Central line series. The work is installed along each stretch of wall on either side of the escalators leading to the Central line platforms. A succession of rough ellipses, varying in size, seems to float above the handrails. These rings are the detailed imprints, reproduced on vinyl, of elastic waistbands from clothing. Moving alongside them up or down the escalators recalls the stop-frame images of a flip book. Hard Metal Body expresses Channer’s desire to inhabit and communicate with the industrial surfaces of the tunnel. She attempts to set up an exchange between her own soft human body and the cold metal surfaces of the tunnel. This is achieved through an indirect reference to her human body in the form of the stretchy clothing that we usually wear close to our skin. Cornelia Baltes, Nicolas Deshayes, Adham Faramawy, Jack Lavender, Berry Patten, Sabrina Ratté, Travess Smalley and Oliver Sutherland. According to Greek mythology, the Chimera was a monstrous fire-breathing female creature composed of the parts of three animals: a lion, a serpent and a goat. In popular culture the term has been used to describe any fictional being composed by different parts as well as to describe illusory ideas and actions. 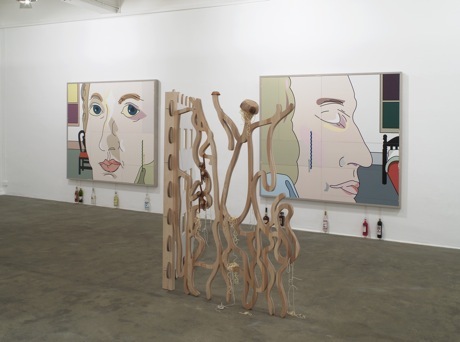 Taking inspiration from the creature’s composed physicality and fictional being, the show reflects on new forms of abstraction and intangibility derived from the assemblage of different styles and materials often associated with the internet and its context of visual and narrative fragmentation. The presented works mix personal visions and popular culture with digital aesthetics, aiming to reproduce heterogeneous feelings and an interpretative contingency. Diversity in forms and the use of apparently distant tools and references are the point of departure to create a fictional sense of transcendence and fluidity. Curated by Attilia Fattori Franchini. Modern and Contemporary works for the David Roberts Collection. Acquired from the mid-90s onwards, the David Roberts Collection, comprising 1800 works by 750 British and international artists, is one of the UK’s most significant private collections of modern and contemporary art. Selections from the Collection have previously been on view to audiences at the David Roberts Art Foundation premises in central London. Now, for the first time, highlights of the Collection will be exhibited in a public art gallery. Bruce Nauman, VALIE EXPORT, Gordon Matta-Clark, Stuart Brisley, Gilbert & George, David Shrigley, Phil Collins, Ryan Gander, Joao Onofre, Murray Ballard, Martin Kellett, Darren Cullen, Sara Punshon, Rafael Rozendaal, Nicholas Keogh, Clarita Lulic, Marjolaine Ryley, Pablo Wendel, Edwin Li, Gaetano Pesce and Teal Griffin. ‘Moral Holiday’ presents the work of two generations of artists who have created works largely in lens-based media from still photographs to film or video. All stage what might be called ‘thought experiments’ that query the existing moral order, and dramatise ethical quandaries by inverting social norms or expectations. The exhibition brings together seminal works by radical artists who came to prominence in the late 1960s and early 1970s, alongside works by younger artists from Amsterdam, Belfast, Lisbon, Glasgow and London. The show includes the UK premieres of works by five of the artists. Tracing the Century highlights drawing’s fundamental role as a catalyst and vehicle for change in modern and contemporary art. The exhibition includes around one hundred artworks from the Tate Collection together with key loans by artists such as Sara Barker, Leon Golub, Jasper Johns, Julie Mehretu, Matthew Monahan, Richard Tuttle and Hannah Wilke. Tracing the Century has at its heart artworks based on the human body and the inner self, opening up the conversation between figuration and abstraction that characterised art in the twentieth century. Rather than approaching abstraction and figuration separately, the exhibition will integrate these genres to explore the continuous slippage between the two. Cosmic Dramas brings together, for the first time, three important installations by Liliane Lijn, long recognised as amongst the most interesting and innovative artists on the international art scene. Using a broad range of materials, media and new technologies, Lijn entwines ancient mythologies with science fiction in these key works, created in the 1980’s. Between sculpture and theatre, the Lady of the Wild Things, Woman of War, The Bride and The Electric Bride are the result of a decade of research for a new feminine ikon. The exhibition also features studies and drawings for the works from the artist’s archive.